Blepharoplasty, or eyelid surgery, is a wonderful (and surprisingly easy) way to look more awake, inviting and relaxed with a minimal amount of downtime. The procedure can be performed on the upper eyelids, the lower eyelids, or both the upper and lower lids at the same time. A blepharoplasty removes excess sagging skin and fat pockets (or bags) from the eyelids, and gives the eyes a more open and refreshed appearance with the most inconspicuous scars of almost any cosmetic procedure. Dr. Nicholas Vendemia performs eyelid surgery for women and men in the New York metro area. 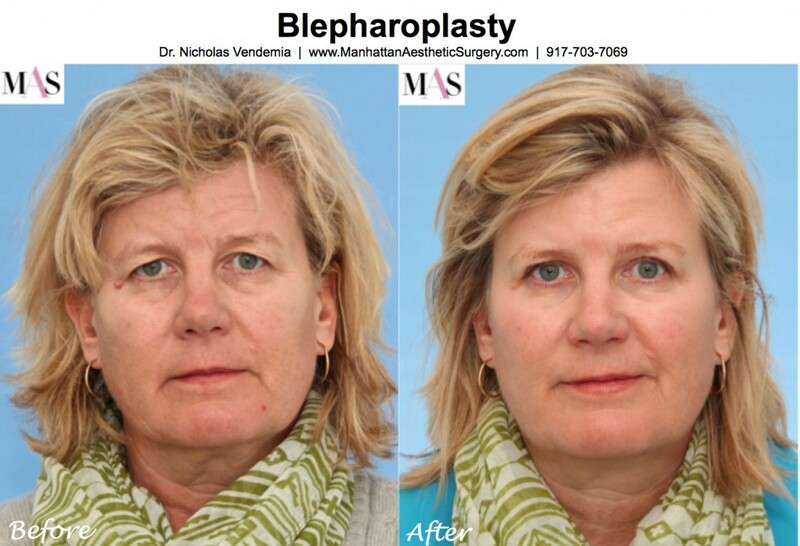 We encourage you to contact us online or give Manhattan Aesthetic Surgery a call at 917-703-7069 to schedule a visit. Dr. Vendemia is a leading cosmetic surgeon in New York City with a reputation for custom care and beautiful results. What Problems Will Eyelid Surgery Fix? Sagging skin on the upper eyelids. The main goal of an upper blepharoplasty is to remove excess sagging skin that makes the eyes look much older than they are, and tired all the time. The result of getting rid of extra eyelid skin can be quite dramatic, but also very natural at the same time. People will often comment on how much more awake and relaxed you look after blepharoplasty, but they never know why because the scars are completely hidden in the natural eyelid crease. Under eye bags and dark circles. The main goal of a lower blepharoplasty procedure is to lessen the appearance of under eye bags and dark circles. The delicate connective tissue that keeps the natural fat pockets in the correct position is repaired, and any extra bulging fat is removed to provide a smoother contour to the lower eyelid, and a very refreshed appearance without the bags. Protruding fat pockets in the upper and lower lids. Fat pockets can be a problem in either the upper or lower eyelid, and a blepharoplasty procedure can either reposition the fat pockets in a more natural spot, or remove them altogether if they are excessive. Plan on about 5-7 days of downtime after an upper blepharoplasty, and 7-10 days after an upper and lower eyelid surgery done together. The procedure is not commonly described as “painful”, but the eyelids are very sensitive, so they will swell for a few days and bruising is common but usually gone in less than a week. Because most eyelid surgery can be done under local anesthesia or twilight anesthesia, nearly everyone is a candidate. If you have high blood pressure, make sure that your pressure is completely controlled on medication before scheduling your consultation for eyelid surgery since uncontrolled high blood pressure can predispose you to bleeding complications during or after surgery. Eyelid surgery pricing can range from about $2,500 to $8,000 depending on the specifics of your procedure. The price will be less if you are only having the upper lids done and if you don’t have any protruding fat pockets, and will be more expensive if you add the lower lids and have extensive fat pockets. The only way to know for sure is to schedule a consultation so that the doctor can tell you what procedure(s) you need to achieve the look you’re going for. There are fantastic financing options available. Many of them will offer a period of 0% interest for qualified applicants, and for many patients, the monthly payments can be as low as $200. And the best part of these financing plans is that you’ll know whether or not you qualify before you leave the office after your consultation! If you need more information eyelid surgery, or if you would like to schedule a consultation, please feel free to contact us online or give Manhattan Aesthetic Surgery a call at 917-703-7069.